Welcome to the Ideal-ist Topic Tree! Topic Tree is a visual tool illustrating connections between Horizon 2020 topics related to ICT. 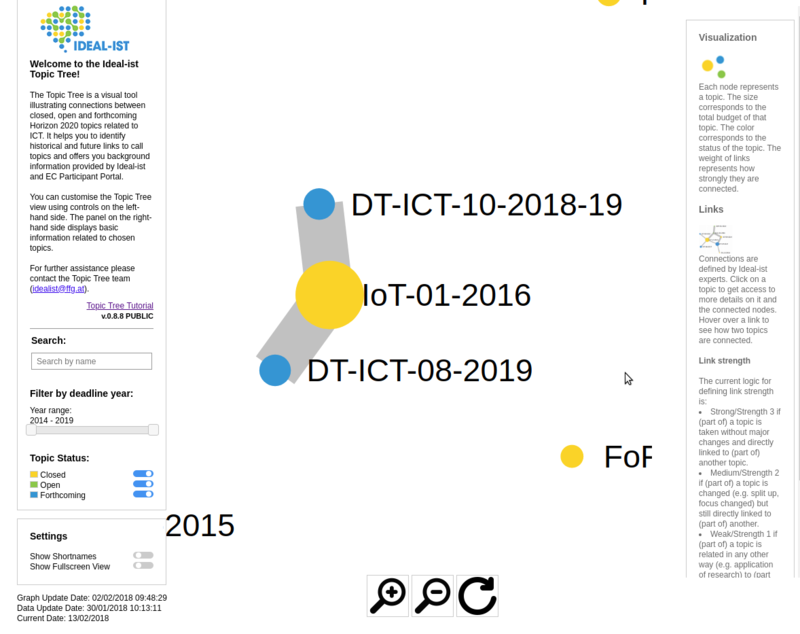 It helps to identify historical and future links between closed, open or forthcoming ICT topics and offers you background information provided by Ideal-ist and the EC Participant Portal. This tutorial page demonstrates how to interact with Topic Tree by searching for topics, showing detailed information about topics and their links and finding and accessing further information via short interaction videos. For a quick reference, a short description of basic Topic Tree components can be found on the right-hand side panel of the Topic Tree main page. For further assistance please contact the Topic Tree team at [email protected]. Topic Tree allows you to interact with research topics in a visual manner. Topics are represented by nodes. 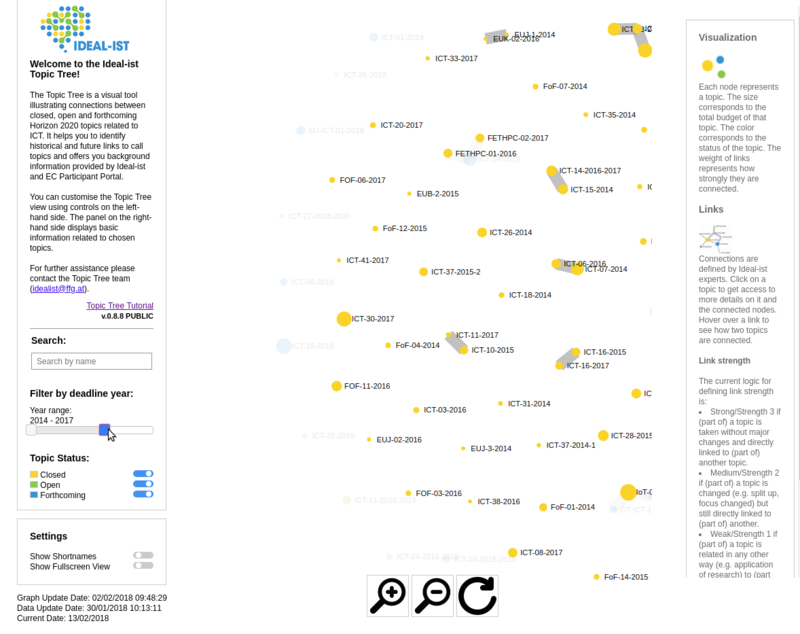 Each node diameter represents the topic's budget with larger nodes representing larger budgets. Nodes are colour-coded, with yellow nodes showing closed, green nodes showing open and blue nodes showing forthcoming topics. The toggle buttons on the left panel allow you to show or hide topics according to their status and the slider above allows you to filter topics with a selected year range. Click on the image on the right to start or stop the tutorial. You can search for specific topics in the Search box either by using terms from the topic shortname or by using the topic's unique identifier. 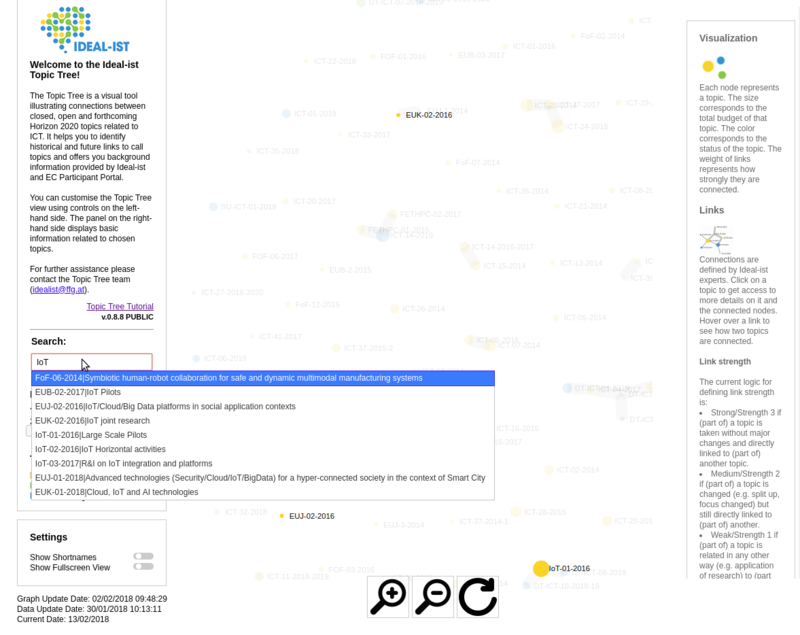 Zoom in to explore the topic's status and connections or links to other topics. Once zoomed in, you can show information of connected topics on hovering or click on a topic to fix the information shown on the right side panel. There, you will find key information about the topic and its connections. For more details on a specific topic, click on the topic link in the right panel, which enters the EU Participant Portal. Topic Tree allows you to explore how different research topics are connected to each other. 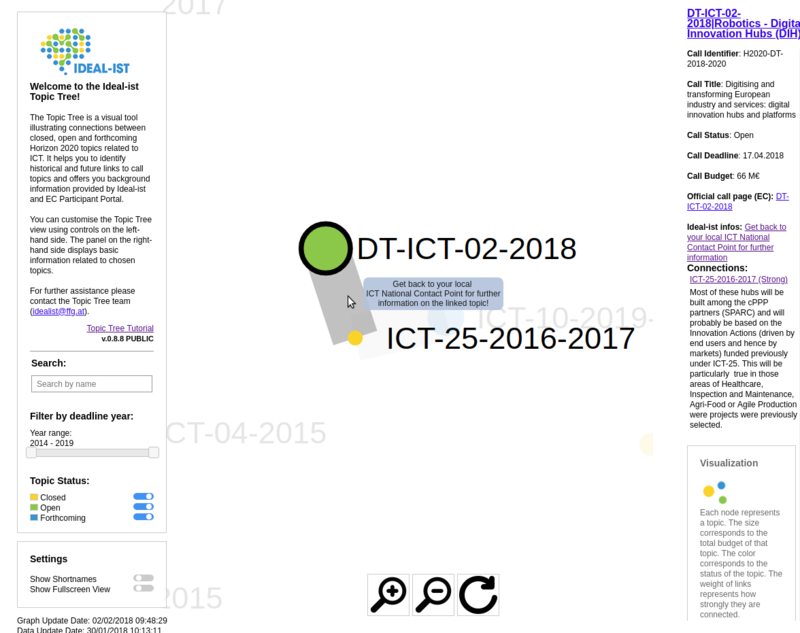 If you would like to know how and why certain topics are connected by visual links, please contact your local ICT National Contact Point by clicking on the link on the right hand side panel. Thank you for using Topic Tree and enjoy exploring!